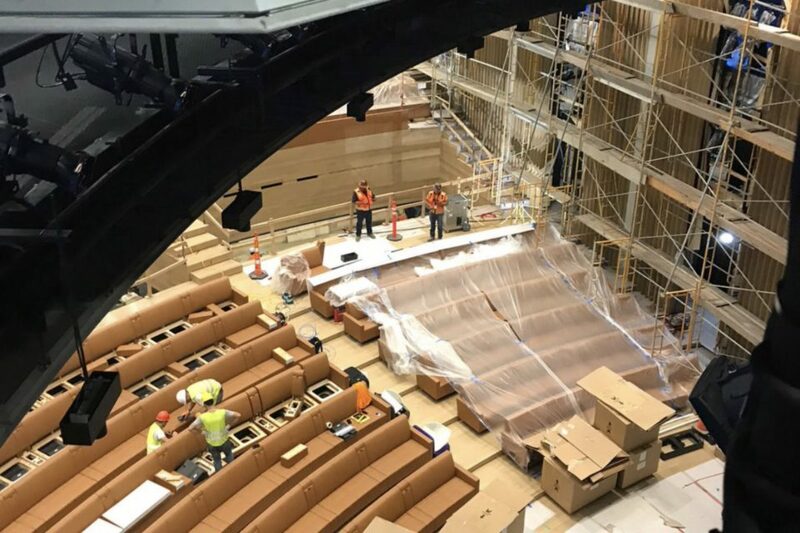 Images uploaded to Google showed work beginning to start on the interior of the Steve Jobs Theater at Apple Park in June, new photos uploaded to Twitter show contractors installing new luxurious leather seating in the main underground auditorium. It appears each seat will feature a power outlet to allow for charging during Apple presentations, with Bloomberg reporting this week that each custom designed chair has cost Apple approximately $14,000.00 to produce. The 1,000-seat auditorium features a 20-foot-tall glass cylinder, 165 feet in diameter, supporting a metallic carbon-fiber roof. The Steve Jobs Theater is situated atop a hill — one of the highest points within Apple Park — overlooking meadows and the main building.